Trying to plan a home remodeling project is tough enough, but it can become even more stressful when you need to try and watch out for scams perpetuated by contractors (or people who pretend to be contractors). These types of con artists and criminals can be very creative. As soon as law enforcement and the general public catch on to one type of scam, the criminals often come up with a new one. It can be hard to try and keep up. That’s why the best way to protect yourself is to just follow some basic general guidelines, such as always listening to your gut instinct and resisting being lured in by pressure tactics—especially by contractors who suddenly show up on your property without you contacting them. You also want to be alert for red flags—there are some common ones, but this really boils down to anything that just gives you a bad feeling, or just doesn’t seem right. Go with your gut if you feel like something is wrong, and that will usually steer you in the right direction. One clue of a potential con is a contractor that seems too eager to get you to hand over some money right away—and pressures you to pay a lot of money before the work even starts. Someone who is reluctant to provide references or gives you information that doesn’t seem to add up is also likely hiding something. 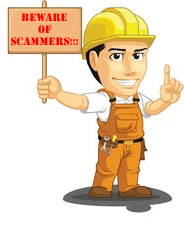 The best way to avoid falling victim to a Scottsdale home improvement contractor scam is to go with a reliable, proven contractor you know you can trust. By asking around and getting recommendations from friends and neighbors, you can be sure to find a contractor that is well established in the area and has a good reputation. When you do ask around, we’re sure you will like what you hear about RW Remodeling.